The fresh air ventilation system is designed to introduce fresh air into a building through an intake damper controlled by a micro-processor logic panel. 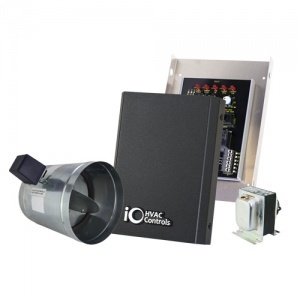 The iO-FAV has single adjustment setup, exhaust fan control option, outdoor temperature and/or humidity limit option and damper override capabilities. It is easy-to-install and meets ASHRAE 62.2 standard. The iO-FAV comes with a 20VA transformer and 8” round damper. The control panel is available separately (iO-FAVPAN) and can be ordered with additional size dampers.